Cayman Islands are a British Overseas Territory formed of 3 islands in the Caribbean Sea – Grand Cayman, Little Cayman and Cayman Brac. Their residents are called ‘Caymanians’. The national symbol of the Cayman Islands is the Green Sea Turtle. I visited the Grand Cayman island, which capital city is George Town. Have you ever been to any of the Cayman Islands? If not, this piece of paradise should be definitely on your bucket list! Cayman Islands are known as an expensive tourist destination. However, you can travel on a budget and still enjoy all the beauty Grand Cayman has to offer. Planning a trip on your own is number one way to budget traveling anywhere around the globe. 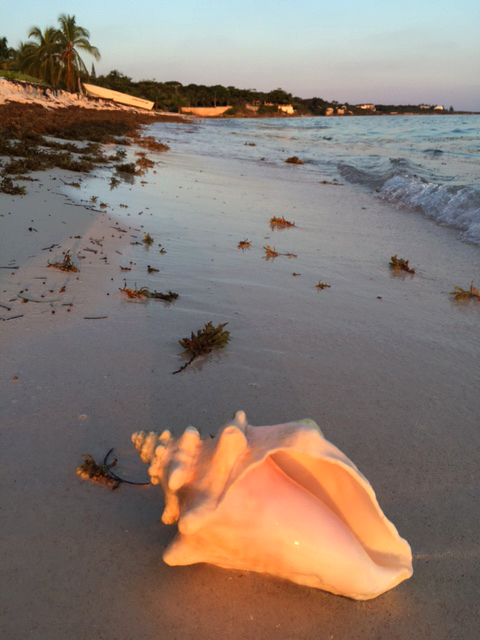 Just keep reading to find out all my savings tips on how to explore Grand Cayman on a budget! Despite the tiny size of Cayman Islands, they have 4 airports. The main airport is Owen Roberts International Airport (GCM), located on the largest of the Cayman Islands – Grand Cayman. JetBlue, Delta and American Airlines offer nonstop flights from New York’s JFK to GCM. Savings Tips: I flew to Cayman Islands by using my JetBlue TrueBlue points, which I earned through the JetBlue Plus Card. You might consider applying for that credit card and earn 30,000 bonus points, after spending $1,000 for the first 90 days and pay the annual fee of $99. Another way to save money is to avoid traveling during high season. Their off season (mid-April to mid-December) is the time when the hotels have summer sales and offer 20-50% off their rates. During off season the beaches are less crowded, providing more fun in the sun for you! You should rent a car if you want to explore the island. There is a public transportation, buses running frequently from 6 am to 9 pm, however the easiest way to get around Grand Cayman is by car. Savings Tips: If you are on a strict budget, you can use the public transportation. If you decide to rent a car, keep in mind that weekly car rental is always cheaper, gives you more flexibility to explore the island and to buy food from the supermarket every time you need. Dollar and Thrify Car Rentals usually offer the cheapest car rates in Grand Cayman and in many other Caribbean islands as well. Make your car reservation through Travelocity at least a week ahead. You can always cancel it. Savings Tips: The cheapest way is to get a lodging through AirBnb. If you’ve never used AirBnb before, you can accept my invite to join and get $40 off towards your first trip. If you still dream to stay in a hotel on the famous Seven Mile Beach and can afford it, make a reservation at Comfort Suites Seven Mile Beach hotel. This hotel is not necessarily budget friendly but it offers the best price in the area, considering that it’s right next to Marriott and they share the same beach zone. Liquor is expensive in Grand Cayman and can eat up a big part of your budget. Also, keep in mind that if you are arriving on Sunday in Grand Cayman, grocery stores and liquor stores are closed. There is no alcohol sold at the gas stations. The only place open is Treasure Island Resort’s convenience store, where you can purchase overpriced alcohol and basic groceries. Savings Tips: Buy your liquor from the Duty Free Shop at your departure airport before landing in Cayman Islands. Liquor in GCM is only available in the departure lounge in the airport. You can save tons of money if you bring your own alcohol and use insulated bottles such as Hydro Flask to make your own drinks. Bring two insulated bottles so you can use one of them as a water bottle. If for some reason you are not able to make it to the Duty Free Shop at your departure airport, then you can buy local brands alcohol from the liquor stores in Grand Cayman. Local brands are always cheaper than the imported ones. • Cracked Conch Grand Cayman Ocean Front Seafood Restaurant and Macabuca Ocean Side Tiki Bar (West Bay). Go to Macabuca during daily happy hours from 5-7 pm. It is located by the sea. 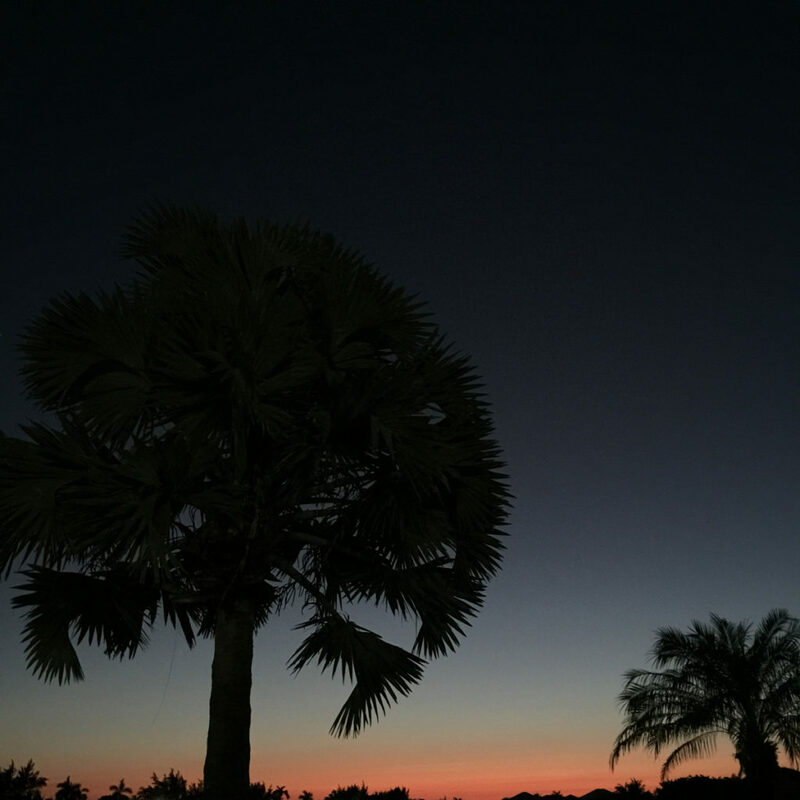 You should definitely get a beer, order their Conch Platter (fritters, cracked conch, ceviche) and enjoy the sunset! 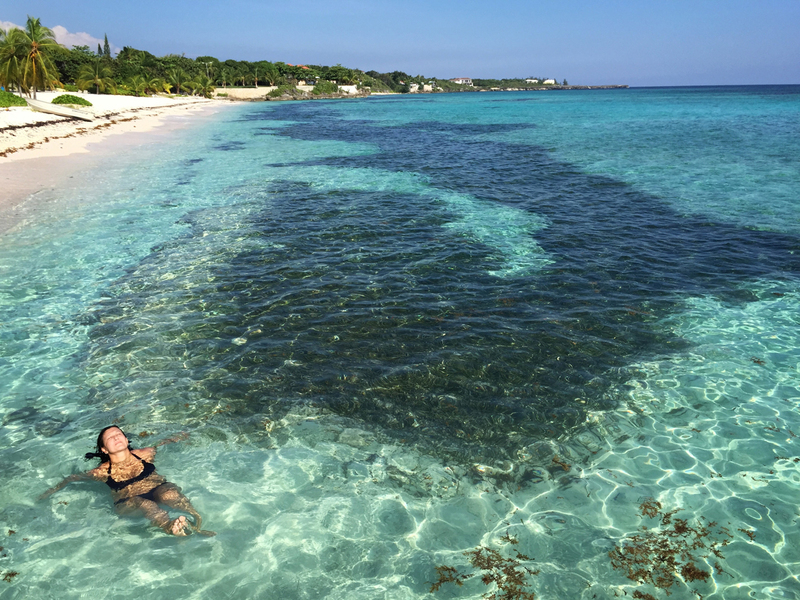 Macabuca offers one of the best shore diving and snorkeling locations on the Island. The ocean side tiki bar is also Cayman’s hotspot for live musical entertainment. Friday and Saturday nights you can enjoy local DJ’s to the hottest live bands on the Island. • XQ’s Pizza Bar Grill (Seven Mile Beach). They are unpretentious restaurant and offer amazing variety of pizza on the rock, as well as the best Happy Hour in town. From 3-5 pm M-F go for a half price pizza and visit them for half price drinks 5-7 pm! Savings Tips: If you are staying in a place, which is equipped with a kitchen, you should buy food from any of the two main supermarkets (Foster’s Food and Fain & Kirk), cook your own meals, prepare sandwiches for the day and save money on eating out. Did you know that despite its name, Seven Mile Beach is actually only 5.5 miles long? Seven Mile Beach is known as the ‘Caribbean’s Best Beach’. It is a long coral-sand beach with clear waters on the western end of Grand Cayman island. You don’t even need to know how to swim there. You can literally snorkel standing up in waist deep water, full with fish swimming around. Seven Mile Beach is a public property, however unless you are staying at one of the hotels there, you won’t be able to use complimentary beach umbrellas and chairs. Royal Palms offers chair and umbrellas rentals, bathroom and a changing room. Savings Tips: If you are not staying at any of the Seven Miles Beach hotels, cheaper option than renting is to buy your own umbrella from the supermarket and to use it for your entire stay. On your last day, earn some good karma and give it as a present to any island newcomers! Kissing a stingray brings you 7 years of good luck! Did you know that according to a legend kissing a stingray brings you 7 years of good luck? 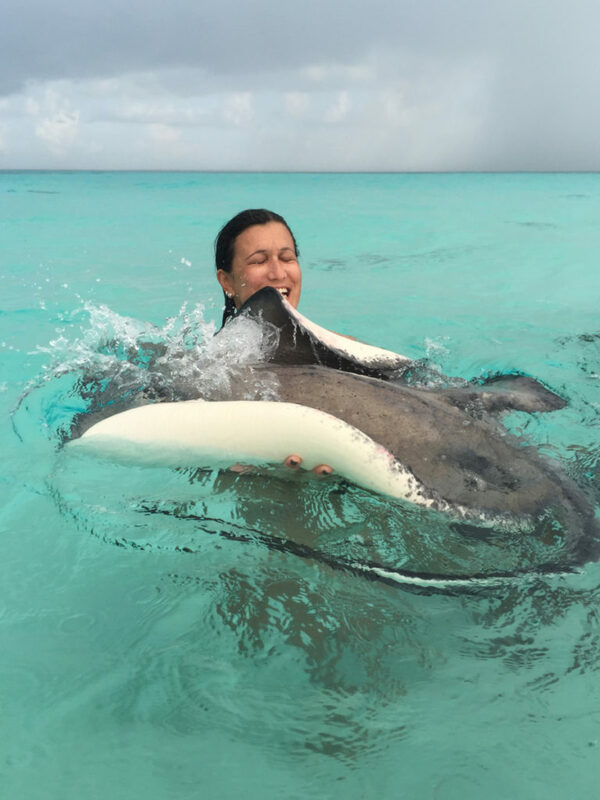 In Stingray City you get a chance to play and kiss stingrays in the middle of the ocean in a series of shallow sandbars. 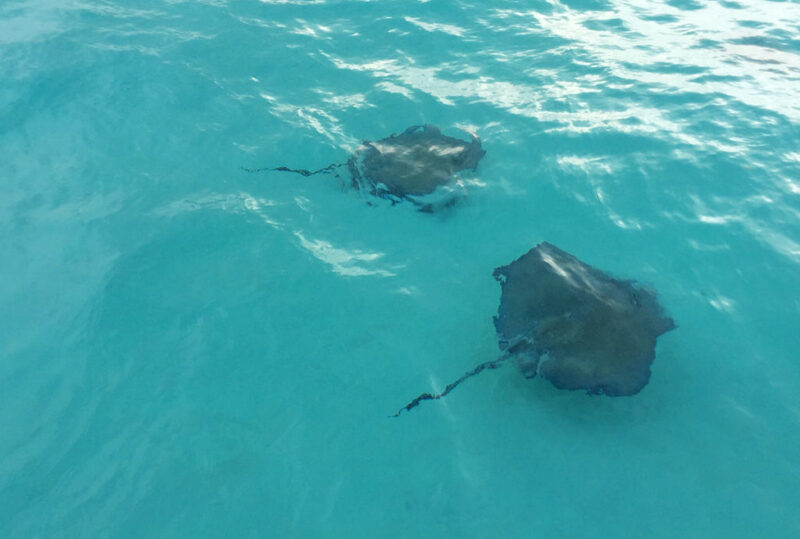 Don’t forget that the stingrays are wild animals – be respectful to them and the marine life. I went on a tour with Aqcuarius Sea Tours but I wouldn’t recommend them due to customer service issues. Also, kissing a stingray on their tour didn’t bring me seven years of good luck! However, I heard a good feedback from other island’s visitors about Captain Marvin’s tours. They offer 3 hours tour to Stingray City and Starfish Point for the price of $59 per adult. You should give them a try and don’t forget to share with me about your experience! Starfish Point in Grand Cayman is a tropical breathtaking escape, located in the northeastern tip of the bay. A tour boat can take you to that location where you can enjoy the view of starfish living there, also known as “sea stars”, who are looking for food in the shallow crystal clear water. Don’t forget to treat with care the starfish and the marine life. 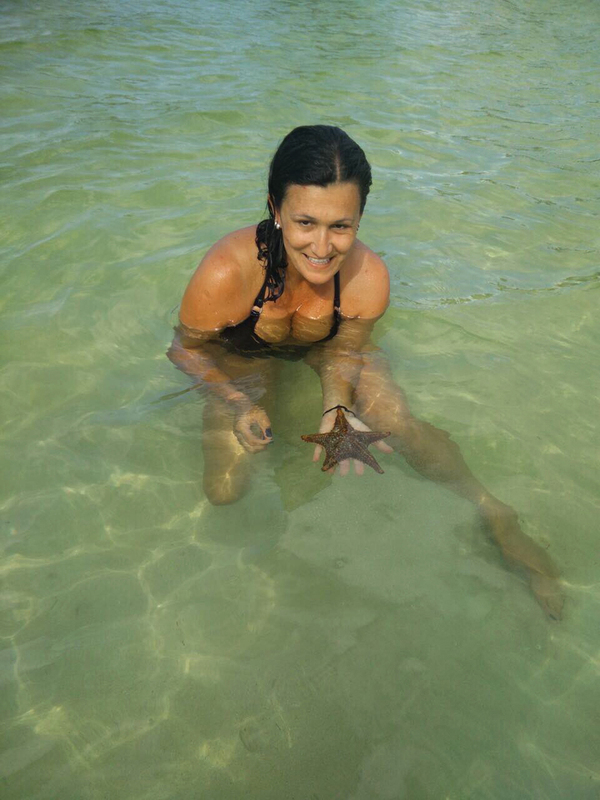 You shouldn’t take the starfish out of water and expose them to air to take pictures with them. If you still want that memorable picture with them, try to avoid fully touching them but slightly bring them up close to the surface of the water, quickly take the photo and let them go. Savings Tips: Skip Starfish Point by boat and make a reservation for a boat tour which includes only Stingray City as a stop. Expect to pay about $35 per adult, which is $24 cheaper than the 2 stops boat tour. Later you can go to Starfish Point by car and still experience the starfish. It is located nearby Rum Point. Rum Point is located on the picturesque North coast of Grand Cayman and it’s about an hour drive from Georgetown. You can walk on a white sand, swim and snorkel in the shallow and clear water, relax in a hammock, enjoy food and drinks at any of the bars and restaurants on the beach. Starfish Point is located nearby Rum Point in a location called Finger Kai. You should drive up to explore that location from a different point of view than the boat tours offer. Savings Tips: Don’t spend money on expensive restaurants in Rum Point. Just visit the area and take some nice pictures. Bring your own drinks and food for the day and enjoy consuming them at any public beach along the road. You are not allowed to bring in food and drinks at the Rum Point beach. Did you know that most public beaches in Grand Cayman are located right next to cemeteries?While you are swimming and being surrounded by stunning views, once you look up towards the road, you see a cemetery. I heard the island has problems with limited cemetery space. Spotts and Cemetery are public beaches, both located by a cemetery. They are excellent secluded locations, where you can enjoy serenity and snorkeling with sea turtles. Don’t leave your valuables in the car and unattended on the beach if you are snorkeling. After all, snorkeling with turtles in the wild is a perfect alternative to visiting and supporting the Cayman Turtle Center, which is a place for endangered turtles and turtle meat farm at the same time. Savings Tips: Pack some sandwiches, bring your water bottle and self made drinks in insulated bottle and spend a day at each one of those beaches. The Mastic Trail is about 50 minutes drive from George Town, located in Breakers and passes through a 2 million year old woodland area. It is a 2 mile trail for hikers with interest in native birds and plants. It takes about 3 hours to walk it round trip. It rises to 60 feet, which is the highest elevation of Grand Cayman.